"A great folk artist transcends their lack of training and produces art that stirs powerful responses. When purchasing a folk painting we look for those elements of exceptional talent expressed in a folk painting. 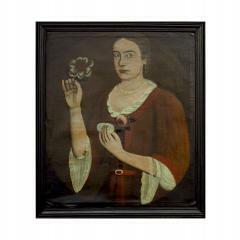 If you do not find a folk painting you are looking for, please call or email, we may not have cataloged it yet." Portrait of Elizabeth "Betje" Van Dyck Vosburg., c. 1725. Unsigned, in original frame; accompanied by a Van Dyke family bible printed in Amsterdam in 1702. Condition: Minor repairs, scattered retouch. 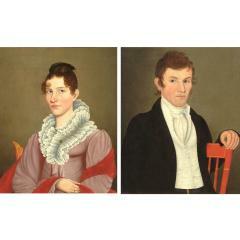 Possibly the work of Ammi Phillips, these portraits portray a lady and gentleman seated in red painted chairs. The light that is captured in the ruffles of the woman's shawl by the artist is beautiful. Their stark expressions are very pleasant. 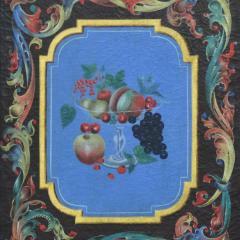 Primitive and charming still life of fruit in compote with blue field, polychromed leafing.